Right then. I’ll be honest: I have nothing insightful to say about this bread. It’s a fairly standard, soft-crusted, whole-wheat dinner roll. I know, I had that lengthy and insightful discussion of yeast yesterday; but I just can’t summon up the brainpower to parlay that into a thoughtful post about this bread today. I would be sorry, except that this is a fantastic bread. Man, are these ever tasty! So I guess I’ll just describe them. First, I want to explain how good they smell while baking. About five minutes after they went in the oven, I caught the first hints wafting in the air. Ten minutes in, and my boyfriend was commenting that they smelled like dessert. And he was right – they smelled like I was baking a cake. Notes of honey and sugar, butter and whole grains melted together into a seductive perfume. Then, when I pulled them out of the oven, I knew at first glance that they would be good. They were perfectly browned on top, and slightly pale on the sides. They pulled apart easily, leaving those flappy little bits that are so good to pull off and nibble on. 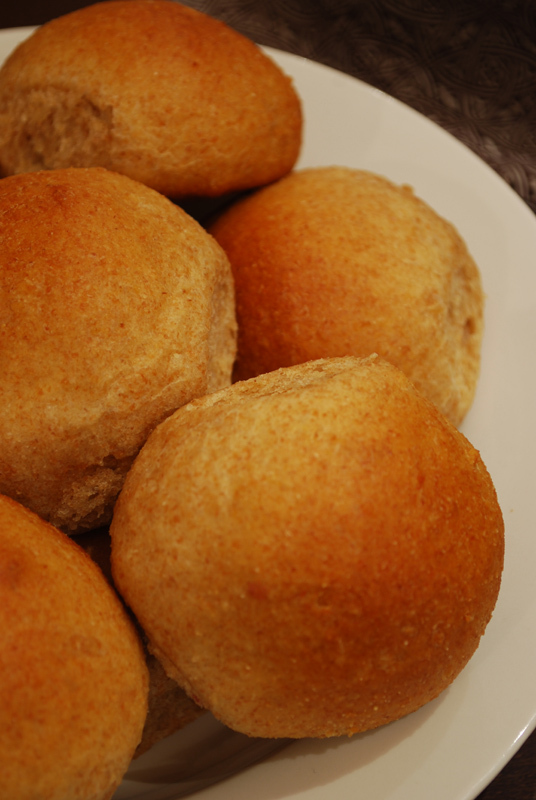 The flavor was spot on, just sweet enough to complement the grainy whole-wheat flour, and soft enough to be a proper American dinner roll. Everyone should have a good recipe for something like this; because I assure you, they will receive rave reviews at any dinner party, or especially at Thanksgiving or Christmas dinner. Like all bread, you can of course make these even a month or so in advance, freeze, and reheat in a 350º F oven, making these a perfect addition to a busy cook’s menu. 1. If you’re using active dry or “highly active” yeast, dissolve it with a pinch of sugar in 2 tablespoons of the lukewarm water. Let the yeast and water sit at room temperature for 15 minutes, until the mixture has bubbled and expanded. If you’re using instant yeast, you can skip this step. 2. Combine the dissolved yeast with the remainder of the water and the rest of the ingredients. Mix and knead everything together—by hand, mixer or bread machine set on the dough cycle—till you’ve made a smooth dough. If you’re kneading in a stand mixer, it should take about 5 to 7 minutes at second speed. In a bread machine (or by hand), it should form a smooth ball. 3. Place the dough in a lightly greased bowl. Cover the bowl, and allow the dough to rise, at room temperature, till it’s quite puffy but not necessarily doubled in bulk, about 90 minutes to 2 hours. Rising may take longer, especially if you’ve kneaded by hand. Give it enough time to become quite puffy. 4. While the dough is rising, lightly grease a 9″ x 13″ pan, or two 9″ round cake pans. 5. Gently deflate the dough, and transfer it to a lightly greased work surface. Divide it into 16 pieces. 6. Shape each piece into a rough ball by pulling the dough into a very small knot at the bottom (think of a balloon with its opening knotted), then rolling it under the palm of your hand into a smooth ball. 7. Place the rolls in the 9″ x 13″ pan, or put eight rolls in each of the round cake pans, spacing them evenly; they won’t touch one another. 8. Cover the pans with lightly greased plastic wrap, and allow the rolls to rise for 1 1/2 to 2 hours. They’ll become very puffy, and will reach out and touch one another. While the rolls are rising, preheat the oven to 350°F. 9. Bake the rolls for 15 minutes, and tent them loosely with aluminum foil. Continue to bake until they’re mahogany-brown on top, but lighter colored on the sides, an additional 10 to 13 minutes. 10. Remove the rolls from the oven, and after 2 or 3 minutes, carefully transfer them to a rack. They’ll be hot and delicate, so be careful. Serve warm, or at room temperature. 1. I used pineapple juice instead of orange juice. It doesn’t really add much flavor one way or another, but the sugar in the juice helps to soften and mellow any harsh flavors in the whole-wheat flour.